Thanks to a lot of people I ,hopefully, was able to crush some bugs. Fixed all the Containers and GUI's to work as intended(I think). Change the look of nesting pens and nest. You can now use Chickens Spawn eggs on nesting pens to spawn a chicken inside of it. You can no use Chickens Analizer on nesting pens to see their stats. Fixed Chickens being rotated in strange directions in nesting pen. 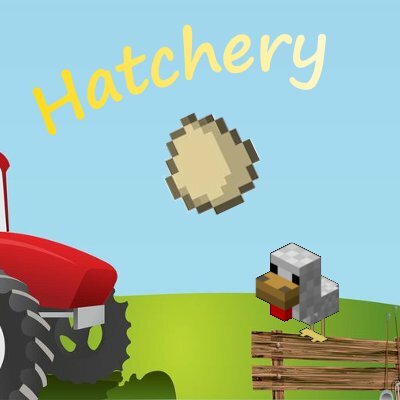 Fixed hatchery eggs not showing Chicken stats. Fixed Guis to actually only allow certain items into certian slots. Added swing sound to animal net when picking up entity. This may be a finish version, but I'm sure crashes and errors will be found. Please report if you find any. If nothing is reported after a while. than i will change to a Release version. Removed a secondary Generator block and replaced it with a Variant. You will get a missing block error. Added a couple more items to the lucky eggs. Removed two custom recipes for fertilizer bucket and refilling the sprayer. The Recipes aren't really needed anymore since, the fertilizer mixer can be used to make liquid fert, and can fill the sprayer. They were removed because they seemed to keep worlds from loading under certain circumstances. Generators my have some issues in next update as I will be replacing come code. be prepared. Egg nest are added back.. didn't noticed I forgot it last update. Currently Chickens dye eggs aren't working. Will fix this as soon as I can. I believe most of the null pointer errors have been found..
Roosters attack anything that attacks chickens.